Which Music Representation is the Best? There are many variations on numbers 1 and 3, and several on number 2. But it helps to consider analogies in the world of text. Audio is like speech; time-stamped events are like unformatted text; music notation is like HTML text. Would it really be better, or even possible, to have only one form? It's much harder to justify the numerous incompatible variations. I've discussed these issues as well as those considered just below in a talk entitled "Music Notation, Representation, and Intelligence"; here are the slides for the talk. It's well-known in the knowledge representation (artificial intelligence, etc.) community that choosing a representation for anything inevitably introduces bias; given a representation, choosing a notation inevitably introduces more bias (Davis et al 1993), and music is no exception (Wiggins et al 1993). Consider CMN (Conventional Music Notation) -- or, more precisely, "CWMN" (Conventional Western Music Notation). CMN is among the most successful notations ever devised, but it's enormously complex and subtle. What are its limits, and what are its biases? It's not always obvious: some bizarre-looking CMN poses no real problems for representation, while some rather ordinary looking CMN poses very difficult problems. This extraordinary slur, the most complex I know of, is from Sorabji's Opus Clavicembalisticum (1930), IX [Interludium B] (Curwen ed., pp. 175-176). It has a total of 10(!) inflection points; it spans three systems, repeatedly crosses three staves (this is also the most staves in a single system for any slur I know of), and goes slightly backwards--i.e., from right to left--several times. Impressive as it is, the complexity is almost entirely graphical: the implications for representation are minimal. I include this example simply to make clear what I'm not talking about. A phenomenon that -- in terms of music representation -- is much deeper appears in a passage from a Chopin Nocturne (Op. 15 no. 2) in which one notehead is a triplet in one voice, but normal duration in another. Consider the last note of the measure, and notice that both "versions" of the note end at the barline; therefore, in the upstemmed voice, it begins earlier than in the downstemmed one! But surely Chopin didn't intend it to be sounded twice, and pianists never play it that way. How should it be represented? This type of notation (where a single notehead that's part of two voices has interpretations in the voices that seem inconsistent) is more common than people usually think. The Brahms Capriccio for piano, Op. 76 no. 1, is in 6/8. A dotted half note lasts a full measure of 6 eighths, or 12 16ths -- but this passage has a a dotted half note that lasts only eleven 16ths (on the top staff, in the second measure of the excerpt). Why? It's obvious that the note really lasts to the end of the measure and no longer. Notating that "correctly" would have required four tied notes; clearly, it's written the way it is to avoid the clutter. 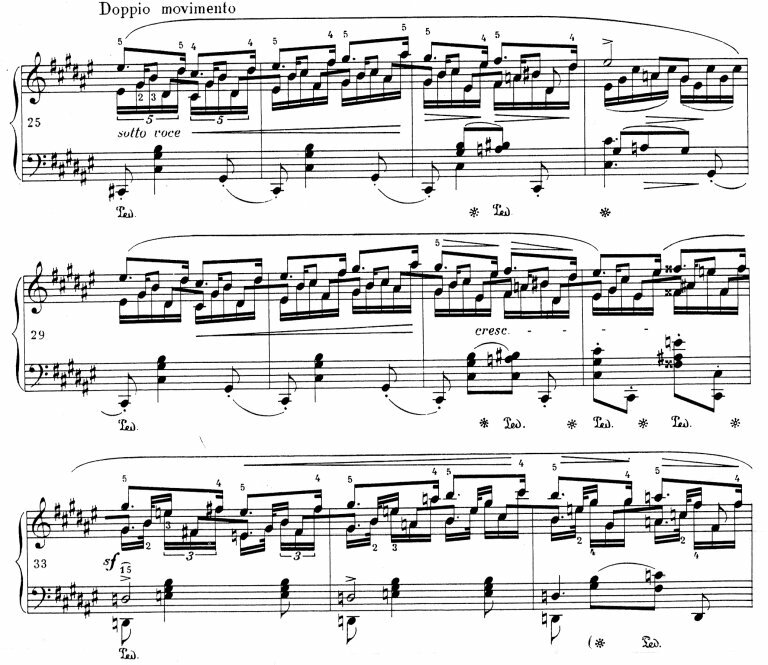 This passage from Debussy's La Danse de Puck has a clef in mid-air, applying only to the note to its right, while a different clef appears on the staff they belongs to. The obvious reason in this and other cases of two clefs simultaneously active on a staff (in music by Brahms, Ravel, and others, as well as other works of Debussy) is simply to save space by avoiding a third staff. Why do these peculiar pieces of notation arise in the music of these highly respectable composers? The interesting thing is there is really nothing very strange going on in any of these examples. In fact, it is easy to imagine a pianist playing through the Chopin and Brahms examples without even noticing anything unusual--and someone listening to any of these examples would probably not notice anything unusual. In my dissertation, Music Notation by Computer (Byrd 1984), I compare music notation to two other systems of notation with formidable reputations for complexity, namely Chinese writing and mathematical notation, and argue that Chinese is really not very complex, but mathematics is much closer to music notation. "In a word, CMN and mathematical notation are fundamentally graphical, while natural language writing is only incidentally graphical." However, music notation is even more complex than mathematical notation, for reasons I spell out. For References, see my music-IR bibliography. Copyright © 2006 School of Informatics, Indiana University. All rights reserved.